Alpine Vapor has perfected the art of morphing live resin into vapable oil, preserving the integrity of the cannabinoids within. What’s the difference between live resin and a regular CO2 cart, you ask? “Live” uses whole cannabis flower instead of bud that’s been dried and cured. Using flower that hasn’t been cured ensures a more robust terpene profile than other cannabis concentrates out there, which you definitely want. As close to nature’s miracle as possible? Please. Live resin has comparable, if not the same, levels of THC as a dab, a very potent cannabis concentrate made with butane (BHO), CO2 and other methods. Studies have shown the cold-extraction process used to preserve the flowers’ integrity and convert it into live resin produces a final product that’s as close to the plant’s original chemical profile as possible. Pretty rad, right? I just blinded you with science! Because live resin contains more monoterpenes you get more lip-smacking bursts of flavor than with other concentrates. Who needs flavored vapes with additives when you can get super tasty live resin? I want my Granddaddy Purple (also the name of my favorite Christmas sweater) half gram cartridge to taste like the advertised indica strain. I’m expecting a very prominent sweet grape, berry profile that’ll keep me relaxed and (hopefully) not knocked out. Will it live up to my expectations? Can I taste a difference in live resin? Let’s vape and break it down. When I first saw this box, it reminded me a bit of the Winter Olympics. The mountain logo is etched in silver surrounded with bright, splashy blue and metallic silver. Seeing the metal and glass cartridge full of clear, almost greyish oil through a small cut-out seems reassuring–but looks can be deceiving. Just be careful as the cardboard is easily smashable. One wrong move and Hulk smash! This Granddaddy Purple indica .5g carton is labeled with standard info: oil type (live resin), strain type, ingredients, net weight, SC Labs tested THC and CBD content (403.5mg THC and 18.05mg CBD), I.D. number, warnings and storage instructions. I wish Alpine added more cannabinoids besides these two. There’s also no mention of Grandmammy Purple and other genetics. Divorced? Deceased? I’d like to know the family history. Inside the cart sits nestled in a white plastic case for extra protection along with a folded instruction pamphlet. However, just like my confidence when I get rejected, it can easily be easily crushed. I like this packaging system, just not the materials. This shorter, fatter steel cartridge has a round, wide tip and pyrex glass tank that’s more durable than plastic and less susceptible to clogging. It’s also a bit heavier than other carts I’ve tried. As soon as I saw this silver-and-blue box, I crossed my fingers for taste explosions plus powerful potency. And I’m here to tell you, wishes do come true so sing it, Jiminy Cricket! The oil tastes very sweet with those beloved grape-forward notes that fade into a heavy skunk finish. Granddaddy Purple is an indica-dominant cross of Purple Urkle and Big Bud (not “Sesame Street” characters), which is why it creates heavy grape/berry notes that thrill your taste buds before being slightly overrun by the piney/gassy taste. The vapor was smooth and easy on the throat and lungs; an ideal experience. The cloud was also pretty thick (though light feeling) and filling on the exhale. Unlike most cartridges, the clear, thick resinous oil looks muted, almost grey; I assume it’s specific to live resin cartridges. 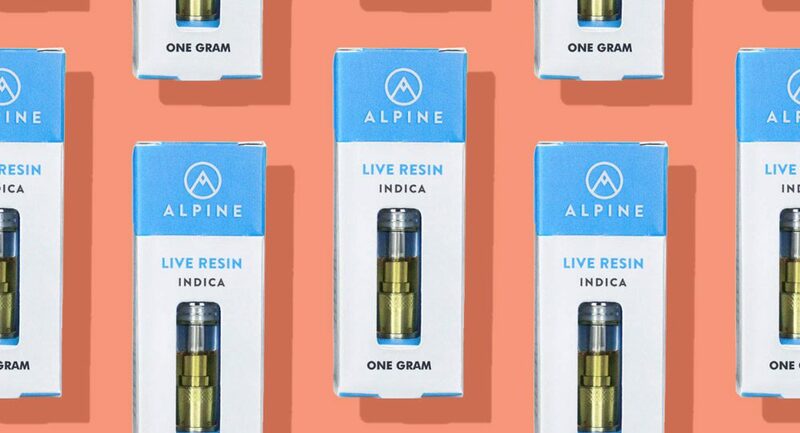 This Alpine live resin cartridge is compatible with most vape batteries (510 threaded). Simply twist on and use. Because the oil is thick you might need to warm the cartridge a little to make the oil more easily vaporable. Also notice that the cartridge can heat up after a few long, consecutive draws; it’ll get warm to the touch so be wary of it getting too hot. After two solid puffs, I was undoubtedly relaxed. This is a great strain for folks with heavy pain and sleep issues. After five, I was nearly asleep within an hour. This strain strongly leans towards indica’s effects that, for me, are sedating, calming, and can knock me out under the right circumstances. I believe this comes from the high concentration of the terpenes linalool, humulene and myrcene within. With this combo of terps and THC levels, this product is ideal to use at night to unwind and calm your mind and body. 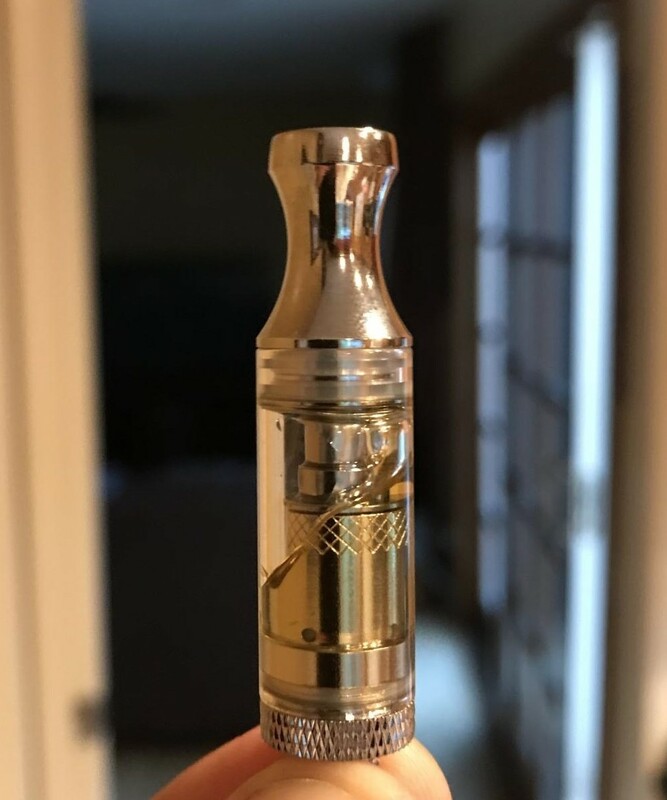 Whether you’re just beginning to look into cartridges for relaxation or a veteran looking for something new to try, this .5g Alpine Vapor indica vape is reasonably priced at $35. Gorgeous color contrasts; compact and flashy. Includes a hole to see the product from the front. Not as sturdy as some other brands. Decent amount of information; lab results, strain and type, ingredients, etc. 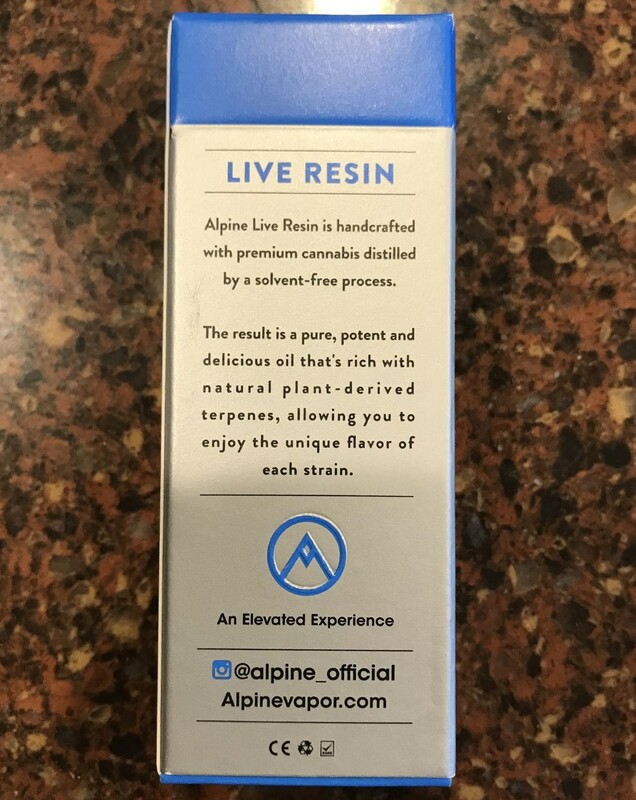 Alpine could have gone the extra mile and include the terpene profile. Solid quality with thick glass and metal tip. 510-threaded for optimal compatibility with the most commonly used batteries. Gets warm to the touch after consecutive longer draws. Delicious sweet grape notes coming through. Slightly overpowered at the end by some skunky earth notes. Had this been more evenly balanced, it would have been a home run. Not overly harsh on lungs; I was able to produce satisfying clouds. Top-shelf flower results in top-shelf oil. Gold in color, clear and thick. Might need to warm the cartridge up a bit to make the oil vaporable. Heavy indica, resulting in feelings of happiness and deep relaxation. Best use is right before bed; after four puffs, I was nearly asleep within the hour. Compatible with most vape batteries (510-threaded). Simple to use, just needs to be heated slightly longer than a cartridge that uses distillate. Each puff was fairly consistent. May experience a faulty or leaky cartridge every once in a while. Requires heating/warming a bit due to oil thickness. At $25 for a half gram, this is very reasonable for a vape cartridge – especially one with live resin (which often costs more due to its smaller yields during the cold-extraction process). After trying Alpine’s Live Resin Granddaddy Purple .5g cartridge, I’m curious to try more of their varieties. Though it’s not one of the “dessert” strains (Cookies or Gelato crosses), this sweet, fruity indica will ease you into bedtime better than a midnight snack. While it’s great for inducing sleep, I also like it for mellow gatherings with friends (just don’t vape too much too fast). I was pleasantly surprised to find it got me giggly and dancing in the living room. The only real downsides were the flimsy packaging construction and lack of more detailed info. Ready to try Alpine Vapor’s Live Resin Granddaddy Purple vape cartridge? Visit the GetNugg.com and search your local dispensary to have this product delivered right to your door!